As a business in San Rafael, we support the plans the city has implemented to reach the goal of Zero Waste by 2025. One of our favorite accomplishments has been participating in Marin Sanitary Service’s pilot program Food2Energy since 2014. The program was very successful and is now offered city wide. Food2Energy collects all food scraps from commercial businesses (restaurants and grocery stores) and, through controlled anaerobic digestion, turns this waste into a biogas. The power generated by this process is used at the facility to pump water, run filters, and clean Marin’s waste water before it runs into the bay. And now another alternative for our food waste is available: commercial composting has begun in San Rafael! While Food2Energy only collects food scraps, the commercial composting allows us to divert food soiled paper and yard waste from our landfill cans to a new composting can. In our business, we do have lots of food soiled paper – paper towels (which are 100% post-consumer content), parchment paper, food soiled cardboard, etc. Besides the paper waste, we can also now put the greenery and flowers used in decorating our platters and buffets into the new bins! Until now, our only choice was to send all of this to the landfill. The benefits are great for our green earth and our pocketbooks. Adding the compost collection service and decreasing the amount of landfill waste is saving us over $100 a month! We now have 2 options for disposing of our food waste in a sustainable manner – Food2Energy and compost. For businesses who choose to not use these options, food waste is sent to the landfill where it does not turn into energy or beautiful compost rich soil. Instead the food is trapped in the landfill, where it decomposes without oxygen, creating methane gas which then seeps into the atmosphere. Not good! So how did we do it? The solution for us to set up a successful program was to make sure we had appropriately sized containers in all necessary areas so that our staff did not have to hunt to find the correct place to dispose of something. We have collection bins for: bottles/cans, clean paper, compost, food scraps, and lastly landfill. Our entire team, including office, kitchen, and event staff, have been trained to make sure all items are properly sorted and disposed of into the correct container. 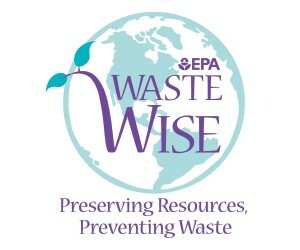 We are united in our goal to be successfully WasteWise. We have made progress, but still have a long ways to go to reach Zero Waste. How are you doing?